Today I’m looking at Bryon’s York’s latest and lo and behold guess what the topic is? At a time when Loughner was increasingly unable to control his own mind, he apparently welcomed “Zeitgeist’s” message that there were sinister forces out there trying to control it for him. The meaning of “Zeitgeist’s” role in the Tucson violence is not that Loughner’s motive was political. It’s that the movie’s insane incoherence proved to be an awful stimulant for one dangerously incoherent mind. When this eventually becomes the story of the shooting, lets not forget who was there before Byron, Before Rush and who kept on this story after ABC dropped it. Answer: Things are so bad for the Democrats that they are touting polls for a race that doesn’t exist. Question: How bad are things actually for the democratic party and liberals? When you need Oprah to pay for people to go to your event, that’s worse. The answer is not so well. Nelson leads Limbaugh 50-36 in that hypothetical match up. Nelson would have his party base pretty well locked up, independents would go for him overwhelmingly by a 58-30 margin, and even 21% of Republicans say they’d prefer Nelson to Limbaugh. 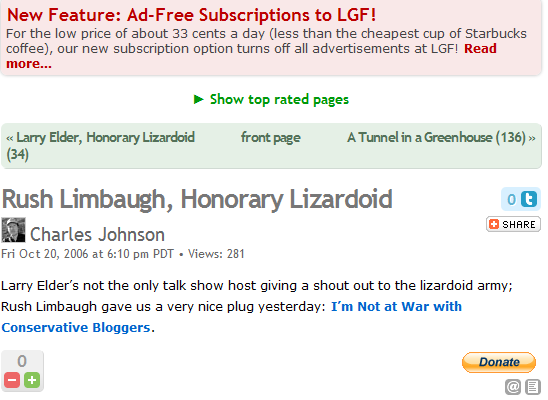 Earth to PPP Nelson isn’t running against Limbaugh and never will be. You make yourselves look like fools when this is what you are writing about 17 days before an election.